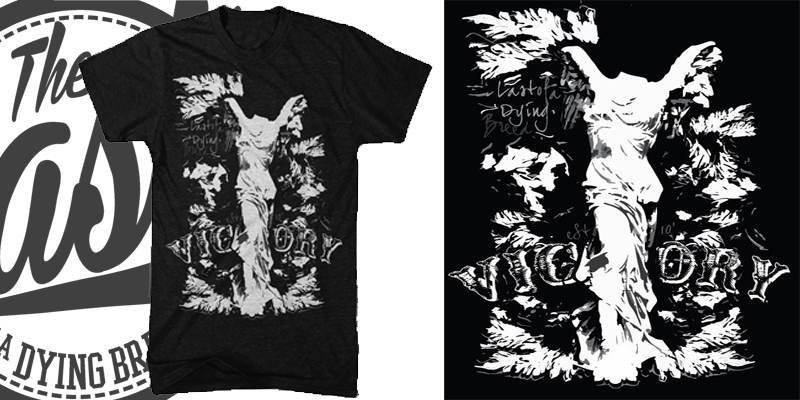 "The Winged Victory Of Samothrace"
The statue represents the figure of Nike, the Greek goddess of VICTORY. Nike was a deity that brought messages of victory, conquest, and success. This is a representation of what we, the Last Of A Dying Breed, strive for - victory over our goals, challenges, and battles! P.S. - Ever wondered where the shoe giant Nike got their name from? 1. the statue is supposed to be the t? if so, usually in cases like this, the emphasized letter is emphasized for a reason. in this case, why would the T be emphasized? 2. a lot of unnecessary color variation. the things that are gray aren't gray for a reason. again it's an emphasis problem i think. the gray isn't helping anything. 3. it's unbalanced. the leaf things on the upper left are offset to the right side which has nothing there, and aside from that, the whole thing is filled. so why the empty spot on the upper right? 4. just looks like a bad live trace. i recommend hiring a designer that can do a good illustration of the nike statue, rather than live tracing a picture of it. 5. everyone knows where nike got their name. if you ever print this, i wouldn't attach is to nike brand in any way, even by asking that question. makes you look desperate like you're trying to piggy back off of nike brand. This is messy. From a distance (and not a great distance), this shirt would blur into what looks like paint all over someones chest. There is no focus, and there is too much going on. The image would be better served as an illustration. Right now the image looks like a poorly done filter effect/live tracing. The "Victory" type is very oddly placed below center on the shirt, yet not on the bottom of the design, and looks like an afterthought. "Last of a Dying Breed" should be the focus of the shirt, and it's barely legible and oddly placed. I honestly would go back to the drawing board. Excellent critiques. I'll definitely take all of this into consideration with this design and future t-shirt designs. Thanks guys!